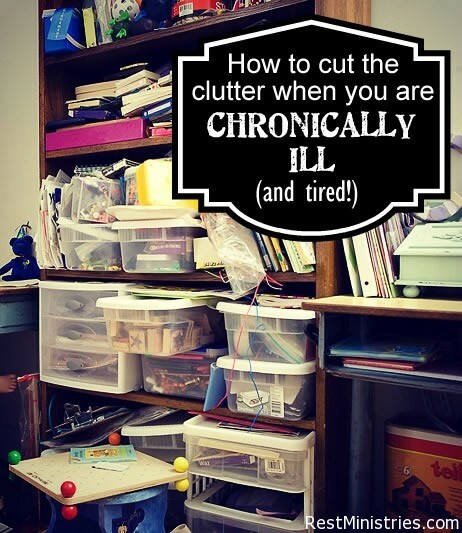 The Dark Secret of The Chronically Ill: Clutter and Mess! How do you cut the clutter and mess when you are exhausted and in chronic pain all the time? 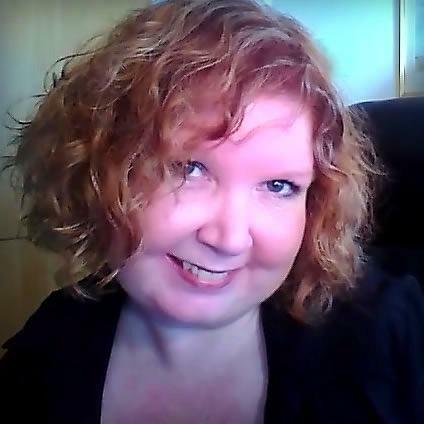 Lisa shares her experience with the clutter. I have walked into the homes of people who live with chronic illness and the rooms are so dark. Navy blue blankets filled with dog hair, dark curtains, stacks of old magazines, broken lamps. The person will tell me how depressed she is, and I understand . . . I know I cannot change her emotions, but I so want to change the environment. I want to do is start collecting items and running the washing machine, opening curtains and fluffing pillows. I wish I could leave her home feeling a bit more cheerful for her, then when I came. As the new year began in 2012 I looked around my home and felt depressed. I had been decluttering for months, yet there was still: Too. Much. Stuff. I wanted a calmer environment. Peaceful. Serene. It took time and I have to constantly work to not let it build up, but at last, not every cupboard has stuff following out of it, every drawer getting stuck. When you are in pain and snuggling up on your couch, despite not wanting to be there, do you feel comforted by your surroundings? I understand that many of us who live with illness do not have an abundance of money. Hands hurt or do not work well. Bodies ache and we can barely get to the grocery store, much less the craft store. But, has your environment taken over your life? I remember when we had to evacuate for fires. I ran through the house filming everything in case it burned down and we needed the tape for insurance reasons. How embarrassing! I swore I would delete that tape if we never needed it. But, our video tapes are kind of disorganized so I have no ideas where it is, except “in the box” of tapes. For years, most of my clothes lived on a pile in my room. My husband had gradually taken over our walk-in closet and I could no longer walk in it and the clothes in there were too small anyway. Do you get the picture? It was not a pretty one. So, for the last year and a half, I have been on a quest to get organized, to be intentional about what goes where. Some things I am still struggling with, like mail piling up, the garage being a dumping ground of the whole family, my son’s Legos that seem to multiply every night. But still, I am pressing on. I began with attempting to clean a one-foot square area per day, Monday – Friday. I am going to share some posts here at Rest Ministries for awhile about getting organized, decluttering, crafty projects on a budget, how to use Pinterest to change your life, and how to simplify. I think it is one of the dark hidden secrets among many of those of us with chronic illness. The junk. We aren’t hoarders–we just have no energy left over to clean, carry stuff outside, move things to the right location, etc. Have I got it all figured out? Hardly! But thankfully, I can see progress. I love to create. I used to cross-stitch and do all kinds of crafts that used a lot of finger power. Now with deformed hands and four silicone joints, I cannot do those any longer. But creating is still a part of who I am–it balances me out. It gives a different part of my brain a chance to work, and something more fun to think about. If you are not a crafty person, that is okay. You can read these posts, or hit delete. Please don’t feel obligated to start creating… but if you have put away your crafty side for awhile, buried it under the pile of “who I used to be,” maybe it is time to get it out and shake the dust off and join us for some new adventures. Why crafts? Because “getting organized” sometimes means finding a new way of doing something, a new use for an old item, a different way of arranging things, learning what motivates you to put something away rather than leave it on the counter. And I would love to see your decluttering projects! Perhaps you will even be brave enough to have a before and after photo. You can upload your photos anywhere you wish (our Sunroom, Facebook (with public status on the image), Flickr, Pinterest, your own web site, etc.) and then link it here to our “Project Declutter Link Party.” That way we can all oooh and ahhh over your ideas and encourage you and maybe borrow a few of your ideas. 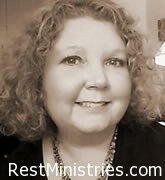 Follow Rest Ministries on Pinterest for some stuff we love for those who are chronically ill, from products to recipes, quotations to tips to make life easier. Filed Under: Articles, Cooking, Hobbies-Crafts, Organizing, Self -Esteem, What's New? 15 Responses to The Dark Secret of The Chronically Ill: Clutter and Mess! Very hard but I do it. 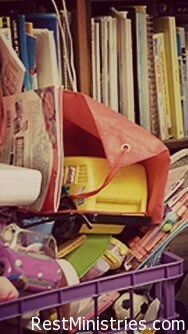 Clutter is a subject with which I am well acquainted! In the past ten years, I have moved 5 times, so I have had as many chances to declutter. Also, I have cognitive impairment and long ago realized that I must simplify, simplify, simplify. Each time I moved, I got rid of another layer of what I used to think was important. So, by now, I am finally at a place where I actually know where my belongings are, or at least what category they are in! The effect of this is that I no longer have that nagging feeling that I should be doing something, like sorting, divesting, or otherwise taking care of my belongings. As Jesus said, (my translation) “The more stuff you have, the more trouble you will have taking care of it”. “Laying up treasures” here below is just a pain in the neck that I can well do without. Thanks for this great post Lisa! 🙂 I used to LOVE storage shops, organizational ideas, crafty things etc before illness. I still love those things, but being a “shut in” I can’t get to those places. It was lovely to breathe that in again & get my brain whirring with ideas. Hmmmm!!! Clutter is growing in our home greatly since I’ve been ill though! I was always the one to declutter & organize our home, but since being ill & bound to recliner & bed it is all piling up. Having much of my dear MIL’s things from her deceased estate isn’t helping our clutter situation. Having 4 males in the house doesn’t help either…..bless them…..they don’t see mess! I do make sure that the area in our loungeroom that I look at day in & day out, from my recliner, is clear & pretty. I have a display table that is interesting & inspires me creatively. A dear friend helps me change it every 6-8 weeks, so that there is beauty. Soooooo important for me to stay positive, creative & dreaming still. Oddly, just before reading this, I was fighting my way out of our hall closet after looking for something I told my daughter I wanted to give her, but there is so much STUFF packed in there – to keep it out of sight (and mind) – I never did find what I was looking for. And now I have the added ‘yucky’ feeling of having disappointed my daughter. This is yet another area where I have to acknowledge that I truly need the Lord’s help. Seems like it should be simple and manageable (I remember a time when it was), but I found myself hyperventilating, squeezing and balancing all the STUFF inside so I could shut the closet door and hide from it all. Baby steps, right? Start small, build on little successes and stop berating myself for what I HAVEN’T done. 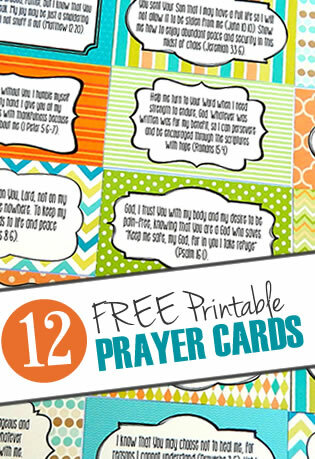 Lisa- I am so glad to see you post devotionals again. It may not be the ‘books’ you dream of writing, but it is still exercising the gift the Lord gave you while in this present season of life. I find that less objects and clutter mean easier cleaning and moving about for me. I cannot twist or bend without significant pain and keeping on top of clutter helps me SLOW DOWN and live thoughtfully and with care. I guess it is a type of material mindfulness. It is a worthy goal. It takes time and patience, I have both even if I lack physical ability. It took two years, but I am now free of most clutter and excess ‘stuff’. It makes my life easier all around now. Thank you, Lisa, for tackling this issue. This is exactly where I am at right now too. It is a tough issue for us. The spirit is willing, but the flesh is so weak!! My kids have all been out of the nest for at least five years now. While they were home I always put off getting rid off all of the things that pile up over the years – old bedding and toys, other used items that are out of date and no longer used and yet not garbage-worthy either. We live 40 miles out of town, so no quick trips to the local charity either. It also makes it difficult to sell things online because people want to see the items before buying them and who wants to drive all that way to look at something? Then there is the painting and general household maintenance that hasn’t been kept up quite the way it should have. That has always been my job, since we are on the farm. (The heavy farm work is done by my husband and there is little time left for him to do anything else). But I am finally eating away at that old elephant one bite at a time, as I have been told is the best way to tackle an enormous job. The other enormous thing I have had to tackle is my desire to hang onto the past and all the thinks related to it. It is just so hard for me to let go of stuff. I have to keep reminding myself of what the space can be when it is all gone – that is what keeps me motivated. At if I let just a little go at a time I am not so embarrassed when it comes into the thrift store with mounds and mounds of stuff I have saved over the years. Here is wishing all of you tackling this project all the best! May you enjoy the wonderful spaces you are about to create! Someone has been sneaking around peeking in windows taking pictures of my computer room! I’m working on it, I really am. But I avoid dark colors and try to keep my clutter bright. lol, that sounds pretty silly, but I do. I can marginally keep up with some serious medicating. I get things under control and then try to get the pain mitigating drugs back to a non-damaging level and the control over the mess goes out the window. damned if I do and damned if I don’t. I’m either perceived as a bad house-keeper/mom or a bad mom/drug addict. Can’t win. You CAN win; it’s an inside job. I’ve learned that it is ok not to live up to anyone else’s standards and expectations. Make peace with yourself that you are ok, you are a winner, you can let stuff go. You can also start affirming YOU. Become educated about fibromyalgia, vow to do the best that YOU can. Ask for what you need from friends, family, community; don’t be afraid of what others think or what YOU think. Be aggressive about obtaining relief from pain. There are many ways to combat pain…try all of them s.l.o.w.l.y. Meditation, heat, ice, prayer, hot tub, light exercise carefully monitored…easy does it, light, humor, and so many more. I have had fibromyalgia for 40+ years. I’m not living up to anyone else’s approval; I’m living up to MY approval and I have had pain that was unbearable, but I have taken the steps to easing, allowing, trying, refusing, accepting, assigning, etc. and I am better each day. I have taken control of my life and I am de-cluttering a little every day. A timer set for 20 minutes is a great tool. When the 20 minutes are chimed, I can make a choice: do I want to go another 20 minutes or do I want to stop, rest. The secret is to pace yourself to avoid over-doing. Learn to love yourself. I heard a great phrase a couple of days ago: Life is full of nuances; Life itself is nuanced. From Type A to Fibromyalgia. I am SO glad to find you! thankfully, in our country we have some innovative women that offer a service to come and restore order into your home. After seven such 8 hour meetings i had my home looking beautiful and orderly again. I threw out a lot of stuff and I feel light more energetic and calm. We stayed only with the things we needed and didnt want to part from. A good startup for anyone interested to make good money while bringing relief and a smile to those of us that need help. I think bringing such a service to our home once a year would probably do us a whole lot of good. Thank you for talking about this. It’s truly nice to realize that there are some people that do understand what it means to have this whole scenerio compound on you. I feel awful 95% of the time, chronic & then to have others label you a hoarder, when your not, their are circumstances & you need help..loving help. I would like to see a show that “a day in the life” that encompasses all of the challenges with outcomes..
Hi! so happy to have found your site. I was diagnose with fibromyalgia and FCS about 12 years ago. We moved 4 times in the past 10 years. I have 2 kids. I stop working 5 years ago, not able to keep a job because I did not perform enough 🙁 I felt horrible. My house now is a mess! When I have a good day I still hurry to try to do everything and after I am down for a week 🙁 We are looking into moving again (following my husband job) There is SO MUCH to do… I am trying to organize everything, but we have to de-clutter first and OH BOY!!! I suggested asking for help… I an certainly not there yet, I don’t want them judging me even more then they already do! anyway, sorry for the long post! I just wanted to say that I am happy to know I am not the only one struggling with that.